This is a week of ALL THE POSTS! A perfect cup to keep you sharp as you hunt in the snow-covered mountains. Or, you know, just when you’re looking outside at all that snow and need a pick-me up! This tea starts with a bracing dash of peppermint, followed by a woody and earthy sprinkle of lavender, and finishes with sweet, dried blueberries to remind you that summer will come again. But in the meantime, enjoy this beautiful, cold season. This tea is perfect as an offering to Skadi, whether you offer it alone or share a cup with Her. Also excellent for the pure enjoyment of it! You can find Skadi’s Tea here, or have a gander in my Devotional Teas section here. A light, lemony green tea, with a subtle hint of breezy mint, and sweet, nutty coconut blend. Inspired and imbued with the Watcher’s energies, this tea will help keep you sharp! Enjoy this tea as you contemplate all the details of your future endeavours, share a cup with Heimdallr, or simply offer it up to Him. Can certainly be enjoyed without any other purpose than enjoyment too! You can find Heimdall’s tea in my shop, The Forest Witch. And if you’re looking for other Deity’s teas, take a look in my Devotional Teas section. A warm and spicy blend for the Skald Himself. This is how I imagine poetry tastes like, sweet, slightly spicy, and warming. Offer this to Bragi, share a cup with Him, or simply enjoy as you peruse a book of poetry. Also a fortification whilst writing your own stories or songs! Comes in a 20 serving bag of 1 tsp per cup of water. Have a look at Bragi’s devotional tea, or check out my other devotional teas. I’m currently fleshing out Northern Gods, but definitely have plans for a few other region’s Gods in the future! And of course, my fantastical teas, which will be based on delicious foods and drinks to be found in fantastical stories. Currently, there is only Butterbeer, but I am working on Turkish Delight (no worries, I won’t be putting any evil magick inside the tea, compelling you to betray your siblings most horribly 😉 ). A seemingly simple, yet pleasantly deep cup of tea. Inspired and imbued with the Lord of the Sea’s energies, this tea can be drunk by the sea on a brisk day, or when you imagine the rhythmic waves crashing on the shore! Share a cup with Njordr, or simply offer it up to Him. Can certainly be enjoyed without any other purpose than enjoyment too! Black tea mixed with fennel and cloves. You can find the listing here, and check out my storefront here. Like a walk through the orchard. The bees are buzzing in the flowers nearby, and fresh apples are enjoyed beneath the old trees. Slightly spiced, and oh so sweet. Inspired and imbued with the sweet Orchard Keeper’s energies, this tea is a lovely way to relax outside, or dream of the ease of summer! Enjoy this tea as you contemplate what delicious apple goodies you’re going to be making, share a cup with Idunn, or simply offer it up to Her. Can certainly be enjoyed without any other purpose than enjoyment too! You’ll find the listing here, and you can check out the storefront here for other delicious teas! A yummy tea for the God of Thunder! Black tea, peppermint, spearmint and Belgian milk chocolate steep together to make a delicious tea to share with Thor. Black tea and chocolate provide a sweet, earthy, and warm base for the mints to float upon, reminding you of that storm on the horizon. 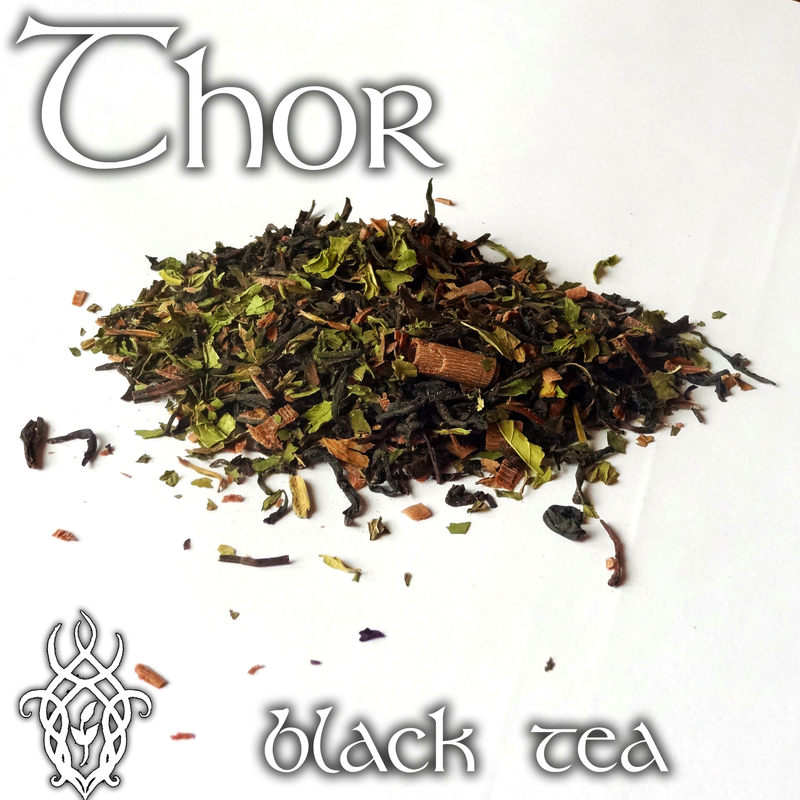 Have a looksee at Thor’s tea, or browse more devotional teas here! For the third prompt of The Pagan Experience, I made the realization that I don’t think I’ve ever mentioned much about Who I work with. I usually say something vague, but imply that there is Someone/multiple Someones I have contact with, but not much in naming names. I also honour my ancestors on a very regular basis. They have leant much support during my not so sunshine and rainbows period (read below). So as for the Gods, I think part of the reason I hadn’t usually shared with many people, including on this blog, Who I had worked with is for quite a long time until a few years ago, I always fancied the Greek pantheon, even called on Aphrodite and Pan most oft in whatever magick I was doing, or occasional ritual. Though I had an interest in Them, I’m not sure the feeling was mutual, perhaps they appreciated my honouring Them from very afar, I cannot know. So up until a few years ago, things were less polytheistic, and leant more towards all Gods are one sort of thing. The God and the Goddess archetypes, and Their many faces. With this distant sort of relationship, I guess I was just getting myself worked up that it wasn’t worthy enough? It suited me just fine all on my own, but in sharing, if ever it changed (which it did), I wouldn’t want to be seen as flakey or, whatever word better suits this situation that I can’t currently think of. It’s really quite an interesting cognitive dissonance on my part because I’m very much a proponent of the constant learning as you go along (we’re never done with learning). This means that things will always be changing. It didn’t necessarily mean that I was or was not going to be working with Aphrodite and Pan for the rest of my life, but I think maybe I knew even then that They weren’t really the Ones for me. Along with the change aspect of learning is the fact that just like human people, I know some Gods, some Spirits would come and go. Each with Their own lessons in the contact and relationship, however long or brief. So this was a little over two years ago. Then Odin showed up. That’s when I realized that it was natural for me to honour a few Someones Who inspired me, but now there was actual interaction with Someone. Thing is, I had never really been interested in Norse mythology or their Gods, it was much too hard and “not pretty” to my younger self who was very much into the prettiness, the decadence of the Greeks. I will admit, Skyrim probably honeyed the way for me into the Scandinavian cultures and Gods. I have since come to love the Norse culture, especially since after Odin popped in, women’s issues became very important to me. It wasn’t that He spurred this lady stuff on, it was a culmination of everything that was going on for me at the time. With that in mind, Scandinavian cultures being what they are and were even a long time ago when the Vikings were doing their thing, how free their women were, well, there were a lot of lessons in simply the study of the culture and mindset as well as the Gods for me. A lot of it has allowed me to really strive to live the way I want to, more so in being firmly rooted in who I am as a person, and how I interact with other humans. In not apologizing for not wanting to fit into a teeny little culturally/socially appropriate box. In not apologizing for saying no (something it seems women are thought not supposed to do). But back on track! Along with Odin, came Frija. She hasn’t been, and is still not very prominent, or at the forefront of it, but more like Someone to aspire to (a lot of contemplation over Herself being so very secure in every role She plays), and Someone Who has let me know is there, even if She’s not very close by. She’s been a gentle but tremendous support for me. That all being said, as I look back over the past two years, Odin and Frija seem to have layed stepping stones for me. Brought me through the gate leading to Who I’m supposed to be working with; they’ve eased me into familiarizing myself with Their stories, Their values, etc. Well, hang on a moment, I can’t say that this time was easy, I dealt with a lot of depression then, things were very dark at the time for several reasons I shall keep to myself. Needless to say, Odin sort of ferried me through a mostly awful year and a bit. He was a rock for me. And I am incredibly grateful for His role in all of it. And to end it with Who is currently coming around, well, it’s Baldr. It seems kind of fitting that Odin has brought me to Him, He is a psychopomp, and have I not been brought to One Who has died? Dead, and yet not dead and all that. I suppose this relationship is something that I will likely be sharing more of in the future, as long as He approves. The only thing is that there doesn’t seem to be many of His devotees, well, at least online. I realize this is a sad thing in terms of seeking a bit of community, but a good thing that my experiences can be truly my own with Him, not tainted with doubt because my interactions don’t look like others’. So there it is. It’s all laid out for you, dear gentle reader. If you had only kind of guessed at what my spirit interaction looked like, now you know from my own mouth. Well, my own fingers. It’s a good time for the Gods, and spirits of all kinds, methinks. Hail to the Wights of Land, Sea, and Sky! Hail to Aphrodite and Pan! Hail to Odin and Frija!